Devoted to the appreciation of birds, this section explores naturalists’ accounts, birds in history, birds in myth and fable, displays bird art, tells stories of birds, and even poems about birds. It also covers birds and the environment and reveals the role of birds in the garden. Birds had been around for over one hundred and fifty million years by the time humans appeared on the scene. We came to self-awareness surrounded by them, and as there were few of us, birds would not yet have learned to fear us: as Charles Darwin and others discovered, they could have been knocked off their nests with a stick. Doubtless birds and their eggs were our first fast food. And birds would have been present in great numbers. As recently as 1813, John James Audubon rode all day under a sky filled with migrating pigeons. He reckoned that a billion birds had flown past him by nightfall. 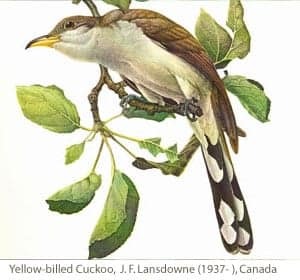 In 1866, another legendary flight arrived in southern Ontario: over a mile wide, with an estimated two birds per square yard, it took fourteen hours to pass overhead. Subsequent estimates suggest there were more than three billion birds in that assembly. Perhaps because they were common enough to be commonplace and were relatively easy to kill, birds are rare in Paleolithic cave art, but they are vibrant players later, in myths and stories from all cultures. Finland’s great national epic, the Kalevala, features a “beauteous duck” and her eggs, which become the earth and sky. In the north, loons and various other diving birds are credited with bringing mud up from the primordial sea so that dry land could be fashioned. Among the Yoruba, a hen with five claws spreads a handful of earth until the seas are parted. Inanna, the Sumerian goddess of love, was depicted with wings; Horus of Egypt had the head of a falcon. When St Matthew¹s Gospel described “the Spirit of God descending like a dove” and alighting on Jesus at his baptism, it was partaking of a tradition that reaches back into pre-historic times. So for that matter were the Mayans when they venerated Quetzalcoatl, their all-powerful plumed serpent. It is noteworthy that by the time of the Greeks the gods had been assigned two attributes possessed by birds, but not originally by men: flight and song. The more godlike you were, the more birdlike you were as well. Man is the only singing primate; a fact that may cast some light on the ancient connection.